Cruftbox Cruftbox: Bunch of tea! As long time Cruft readers will know, I enjoy a cup of tea now and then. Recently I ran out of my usualy tea and was forced to use Michele's tea bags in the morning. On a recent episode of Diggnation, Kevin mentioned he was getting tea from Adagio. If you don't watch Diggnation, you should be. I like to support Digg when I can and checked out the Adagio site to see the Kevin Rose Tea Sampler. The included types weren't my cup of tea, (ROFL, I'm a punster!) so started wandering around the site. I was impressed with Adagio's sampler tins. With tea I was getting from Golden Moon, it came in a large tin and took a while to drink it all. The site says that the sampler tins are good for about 10 cups of tea. 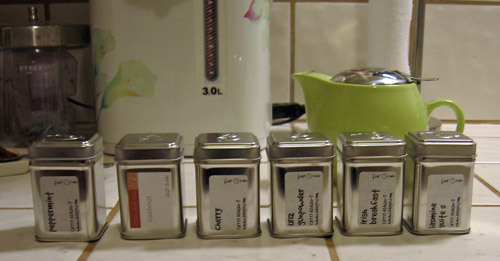 At around $2 per sampler tin, it's perfect for trying a variety of teas. For $12 I bought six different types of tea. What a deal! 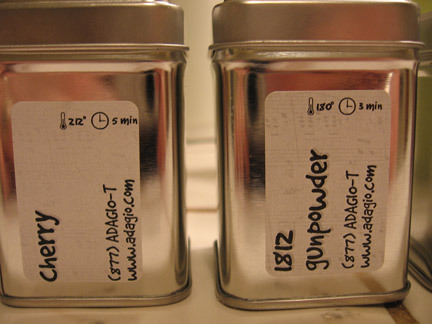 The sampler tins have cool little printed labels that show the preferred steeping temperature and duration. If this isn't a geek tea, I don't know what is. So far, Michele and I have been impressed with the quality of the tea. Coconut is my current favorite and Michele is digging the Jasmine #5. I also think the Gunpowder is tasty with a little milk and sugar. Man whats going on with Kevin Rose's selection of teas? All that time with Sarah Lane messed him up! Did you also get the IngenuiTea brewer? It's an awesome marvel of engineering genius! I've been hitting Tazo myself... Earl Grey for the win. http://www.harney.com/ is my fav place for tea. I used to buy direct from their small store when I frequented north western CT.